This is the thought that occurred to me as I read the following article which appeared in the May/June issue of Tradition, Family Property Magazine (now Crusade). Those of you who take the time to read this article, will find that the slippery slope which America finds itself on is far advance. What is most aggravating about our downward trajectory is that it would have been avoided, as regards our excellent military, had we but listened to Colonel John W. Ripley, who so eloquently opposed the issues brought up in this article. Feel free to comment I would appreciate your comments on this piece. Semper Fidelis …But for How Long? Capt. Barry Crawford Jr., shown here in an Air Force photo, received the Air Force Cross for his heroism..
For Fox News VIDEO Interview with Captain Crawford CLICK HERE. John Ripley, the man at the center of the story. Spring Grove, PA(March 2012) — To most of the world April 2, 2012, will be just another early spring day. To members of the armed forces, veterans, their families, military historians, and other patriotic Americans, the date will evoke images of unfathomable courage: an exhausted Marine captain crawling through razor wire and hand-walking beneath a bridge in Vietnam, rounds from enemy fire blazing all around him, sustained through the ordeal by his sense of duty, his love of country, and his utter reliance on a Higher Power. The 40th anniversary of the destruction of the Dong Ha Bridge — which delayed the North Vietnamese Army from taking Saigon for another three years — is a key historical milestone. Yet Norman J. Fulkerson hopes that Americans will commemorate this day by taking a moment to reflect on the example set by the man at the center of this case study in heroism. 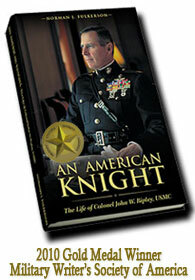 Not just during the operation itself but throughout his life, Colonel John Walter Ripley displayed a rare and priceless quality: moral courage.“While very few of us could come close to achieving the raw physical courage he possessed, we can emulate Colonel Ripley’s moral courage,” says Fulkerson, author of An American Knight: The Life of Colonel John W. Ripley, USMC (The American TFP, 2009, ISBN: 978-1-877905-41-4, $14.95). Does freedom of speech gives us the right to do this….? 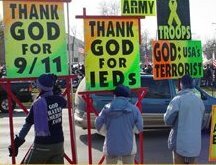 While most Americans mourn the death of our brave warriors, Westboro Baptist Church goes so far as the "Thank God for IED's" that kill them. Take a moment and compare the news brief below with the last article posted on this blog, about the Marine Corps Body Bearers. Westboro Baptist Church, and its founder, Fred Phelps, are known for protesting at the funeral of America’s servicemen. This group had the insensitivity to protest at the funeral of St. Joseph Missouri Native, Army Spc. Edward L. Myers, who was killed in Samarra, Iraq when an IED (Improvised Explosive Device) detonated near his Humvee. Imagine the pain and suffering Myer’s family were forced to endure. Not only had they lost their son (who died serving his country) they were also forced to tolerate a group of people holding signs in support of the very ones who killed him. Marines Corps Body bearers, featured in the last post, treat the mortal remains of deceased service members with the respect and dignity they deserve and one which resonates with the majority of Americans. Westboro Baptist Church, on the other hand, is allowed to dishonor American Heroes, because of freedom of speech. Isn’t there something very wrong about this? What will our young people think if we continue to allow our heroes to be treated in such a way? Is freedom of speech so absolute that it trumps the dignity and sacredness of a last tribute to someone who died for his country? And tramples on the sorrow and pain of his grieving family and friends? Washington (CNN) — Missouri’s tight restrictions on protests and picketing outside military funerals were tossed out by a federal judge Monday, over free speech concerns. A small Kansas church had brought suit over its claimed right to loudly march outside the burials and memorial services of those killed in overseas conflicts. The state legislature had passed a law to keep members of the Topeka-based Westboro Baptist Church from demonstrating within 300 feet of such private services.